A little over a year ago, Boomer Collins was like most Americans when he thought about the sport of cricket. "The only thing I knew about cricket was the games last for two weeks," the former Blue Jays prospect said recently from his home in Texas, "and you've got a chance to tie." Ties are an extreme rarity in baseball, and to most Minor Leaguers working toward "The Show," so are happy endings in America's pastime. A year ago, Collins was an outfielder getting set for his third professional season in the Toronto organization. Now his baseball days may be behind him, but his career is far from over. Collins spent 2014 with the Class A Short Season Vancouver Canadians, the only Minor League team north of the border. He'd traveled to Mexico as well. But never had the 26-year-old flown over an ocean or zipped to a continent a world away. And he'd certainly never done it for the reason he did in December. Yet there he was last month, waking up in Bangalore, India and training with some of the top young cricket players in the world. Over 9,000 miles from his Dallas home, Collins traded in the round lumber of his childhood game for the square surface of cricket's bat. Curveballs have been replaced by rising bouncers. His Blue Jays-colored Nike batting gloves gave way to protective, padded versions along with leg pads and a facemask attached to his helmet. Boomer Collins works on his swing taking soft tosses from his coach Julien Fountain. "That was a new experience in itself," Collins said of the December travel that put him on the other side of the globe. "Then being in a city with millions of people [jammed] in it, it was crazy. They're all packed into one place, so getting around was a crazy experience for me too." So how did Collins go from cricket neophyte to trying to run down a career in the world's "other" bat and-ball sport? The answer lay across a different ocean. Julien Fountain once had dreams of making the Major Leagues himself. Born in Shoreham-by-Sea, England in 1970, Fountain was a young man with sporting feet that straddled the Atlantic. As a young man, he starred in cricket but always had a soft spot in his heart for the game's American cousin. "I hit what I sort of saw as a brick wall [in cricket], but what I didn't realize was I was actually a little younger than everybody around me because I'd been bumped up an age group or two," Fountain said last week from Texas after a training session with Collins. "I became a little disillusioned with cricket at one stage and moved away from cricket and decided that baseball was a potential option for me." As an amateur baseball player, Fountain's skill transitioned easily with the pitcher earning a spot on Great Britain's national teams, taking part in the 1989 and '91 European Baseball Championships and spending time with the team in various capacities until 2002. Over that period, Fountain built a wide-ranging cricket coaching career with youth teams and county cricket -- the highest domestic code in England and Wales -- as well as the West Indies and Pakistani cricket teams. His international coaching work carried him all over the planet. "I've been really fortunate," he said. "I've worked with some of the best players in the world. I've worked with some of the best teams in the world. I've traveled the entire globe doing cricket, but I've always known that there is a very big connection between baseball and cricket because they came from the same sport. There's always been a connection there." All the while, Fountain kept thinking about merging the two bat-and-ball worlds. "I've had this project in my mind since I played because I've always known the crossover would be easier coming from your end to our end than vice versa, having experienced it myself," he said. "It was really only when T20 started to happen that it rebooted my determination to try and get the project up and running." "T20" is shorthand for Twenty20 cricket, a stripped-down and enhanced form of the sport pioneered just over a decade ago. In search of a version of cricket that could capture a younger audience and shorten the span of matches, the England and Wales Cricket Board devised the T20 format with restrictions of one innings (the correct phraseology for the team's turn at bat) and a maximum of 20 overs (a set of six bowled balls). The new game placed an emphasis on scoring as many runs as possible as quickly as possible. Rather than batting for hours or even days at a time trying to stay alive during an unlimited amount of overs like in test cricket, T20 could be crudely equated to cricket's version of a home run derby. "I knew that a pro baseball player could cross over, but [prior to T20], it would've been a little bit more difficult, and perhaps there weren't the incentives there are now," Fountain said. "But 10 years down the road, 15 years down the road, suddenly the world of cricket has changed. There are opportunities and practices and styles of play that would suit a pro baseball player absolutely perfectly. The skills and the attributes that you desire in an elite professional baseball player are the same skills and core attributes that we desire in an elite T20 cricketer. It kind of makes sense to marry the two together. "Before T20 was invented, yes, a baseball player could've come and played cricket, but the potential shortcomings would've been highlighted a lot sooner." T20 prizes the qualities of baseball, and Fountain has always had his eye on a veritable goldmine of such talent -- the United States, and more specifically, Minor League Baseball. "Something I've been making abundantly clear to anyone who asks is I am not trying to poach the best players from baseball away from baseball. You guys do a brilliant job of discarding some of the most talented athletes I've ever come across," he said with a laugh. "If you are happy to throw these kids into the trash, I am very willing and very able to take them and at least give them a potential to carry on playing pro sport somehow, somewhere." Major League organizations employ hundreds of players at a half-dozen or more Minor League levels. Not all of them will find the upper or even middle levels of the Minors, but that certainly doesn't mean their talent isn't considerable. "Julien got in contact with me about a year ago," Collins said. "I was still playing baseball at the time, and basically, I just kind of kept it in the back of my mind. I kind of stayed in contact with him. He sent me to his website, and I checked that out." Fountain founded SwitchHit20.com as a hub of information for baseball players intrigued by the idea of a code switch and as a concept for a possible television show about the experience. 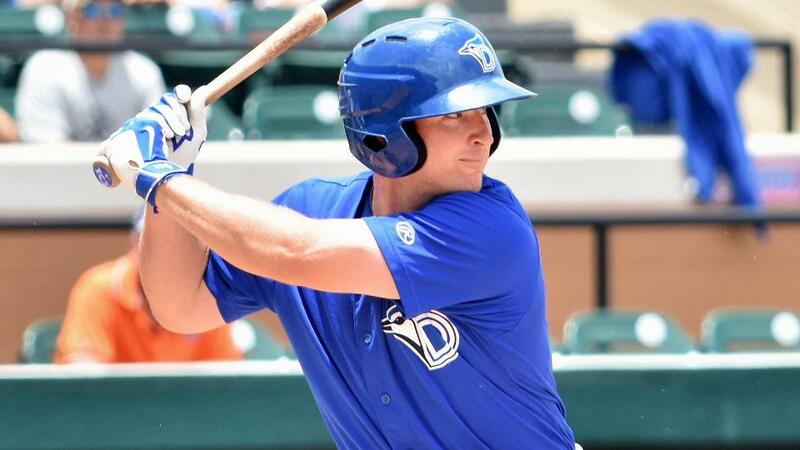 It struck a chord with Collins, who was let go by the Blue Jays in November after playing in 72 games between Class A Lansing and Class A Advanced Dunedin in 2015. All throughout the campaign, Collins had been mulling it over. "I did some research and talked to him about it, stayed in pretty close contact with him during the season," Collins said. It wasn't just "some research" according to Fountain, who praised Collins' devotion and eagerness to learn. "His brain has been ticking over from a cricket perspective for most of the last year." The first week of November, the red light on baseball turned into a green light to an unexpected new journey. "Once I got released, I got in touch with him and was like, 'Hey, let's do this. Let's try this out,'" Collins said. "A week later, he was down in Texas, and we started training. Two weeks later, we were in India training again." For the past two months, Collins has followed the same rough schedule that served him as a collegiate athlete at Dallas Baptist University and later in the Jays system after signing as an undrafted free agent in 2013. Now instead of baseball practice after a morning workout, it's cricket training or at least a combination of the two. "I agree with that. I don't want to be a traditional cricketer. I want to be something different. I want to be something powerful." Fountain was already contracted to go to India for a coaching commitment. He asked Collins to join. The former outfielder obliged, and in early December, he found himself squaring off against some of India's best young cricketers, mixing with members of the Indian Premier League's Royal Challengers Bangalore and picturing days when the white lines and summer nights of the Minors could be replaced by the raucous crowds of international cricket. "The first couple days, I got thrown into the fire," Collins said. "I was with the senior level kids, and I just jumped in there. I got crushed. The first five or six balls that I faced, I absolutely crushed them. They were definitely sixes (a ball that leaves the playing field on the fly), and I just hammered them. Then they figured me out, figured out what my weakness was really quick, that I hadn't yet covered. They just wore me out for about an hour. "That day, I was kind of down. I was like, 'Oh my gosh, how am I ever going to be able to do this?' As the days progressed, I just got better and better. We changed some things. It was a learning experience. I really figured out what my strengths were and how to cope with where my holes were. I learned how to play the vertical shots and stuff like that. In baseball, we don't have any vertical shots. Everything's horizontal. It took a little bit to find that vertical swing, but once you find that, and once you're able to get them out of those tough places, they really have nowhere to bowl it. The last week and a half, I really came into my own." "He's made such great strides in terms of the actual physicality of hitting a cricket ball, of playing cricket," he said. "If you go back and look at the first video that we shot and then look at the last one, you'll see that it's just evolved brilliantly. He's got some fantastic technique now. Every single day, he gets better and better." When Fountain returned to England after the trip, Collins took his training back to DBU, setting up the Patriots' pitching machine to bounce cricket balls to him. When he can't make it to his alma mater, his family lends a hand. All over, interested observers take notice. "Family is huge to me. Having them out there supporting me is huge. I think my wife (Rachel) probably liked [bowling to me] more than I did. She was probably a little cold, but she got to throw balls at me and try to hit me the whole time. "She got to let off a little steam throwing balls as hard as she could at me," he laughed. The next step for Collins will be measuring himself on the field in live matches. For now, that's in a local league in Dallas. Soon, it could be on a far bigger stage. Collins has registered for February's Caribbean Premier League Draft, hoping that one of the competition's six teams will give an opportunity to cricket's first converted professional baseball player. "The CPL [season] isn't until July," Fountain said. "I can honestly say that if a team decides to pick him up, we will obviously create a training program from February through to July, and there is absolutely no doubt in my mind that he will be more than ready to play. "We've already broken holes in the dam, but the dam hasn't collapsed yet. If he signs a contract, that dam's going to disintegrate within seconds, and you're going to see a flood of people interested in him." The sport may not be fully ready, but Collins and Fountain are. "But he can. And he is."